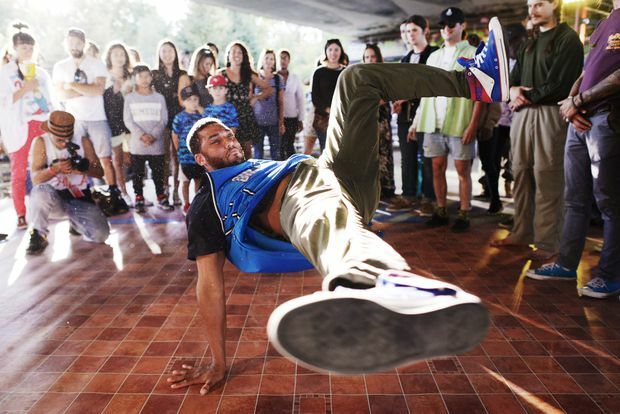 Arnaldo Betancourt Silva, known as Bboy Effect, dances at the House of PainT Urban Arts festival in Ottawa last year. Ad hoc street celebrations, bike rallies and workshops have become common in the Canadian capital, with the diversity of the city's culture reflecting the increasing diversity of the people who live there. As well, politicians have finally started to get their act together. A generation ago, the three big questions facing the city were: (A) what to do with the rundown and underused Lansdowne Park area; (B) how to redevelop the barren LeBreton Flats on the western edge of downtown; and (C) whether Ottawa needed a light-rail system. Three decades later, Lansdowne Park has finally been redeveloped as a mix of shops and restaurants, along with a redeveloped stadium, and the city is getting a new central library as part of the ever-so-slow filling-in of LeBreton Flats. An arena for the Ottawa Senators is planned for the site, and the transformation of abandoned industrial lands at nearby Chaudiere Falls into a new commercial and residential hub called Zibi will finally connect the city with the Ottawa River, and with Gatineau, on the Quebec side of the national capital region. And in November, a spanking new LRT is scheduled to start moving passengers, the biggest infrastructure project since the Rideau Canal, and one that goes underground as it passes through the downtown core, which should help spur the renewal of the rundown parts of Centretown. Redevelopment is far from perfect. Paul Kariouk, an architect who also teaches at Carleton University, believes that politicians at the municipal level, especially, are too quick to sell off public lands to private developers − he is particularly unhappy that Lansdowne Park is mostly a shopping mall − with little sense of creating a truly special urban environment. “They put on blinders and they don’t learn from what’s already happened in other cities in Canada and around the world,” he says. Nonetheless, openings and reopenings abound: The old train station across from the Chateau Laurier will soon house the Senate, and a rebuilt West Block will host the House of Commons as Centre Block undergoes a decade-long restoration. The brutalist National Arts Centre has an elegant new glass skin; the Ottawa Art Gallery reopened in new digs earlier this year. Even the dilapidated Sparks Street pedestrian mall is starting to show signs of life, thanks to encroaching new condo towers. Most important of all, Ottawa remains remarkably affordable, which is helping fuel the third demographic trend reshaping the city: the renascent tech sector. After the dot-com bust of 2000, many of the region’s technology firms closed or downsized. But a new wave of companies led by e-commerce giant Shopify, along with the survivors from the old days, now employs 70,000 workers, many of them young hipsters drawn to Ottawa in part because the average home in May sold for $386,000, half its Toronto equivalent. Kenniy Olorunnimbe, who is 36, arrived from Lagos in 2013 to study at University of Ottawa. Today, he is a software programmer at Klipfolio, a young company of about 100 employees that helps businesses accumulate and visualize performance data. “For quality of life, we can compete with any city in the world,” says Allan Wille, Klipfolio’s CEO, although he admits he tries to avoid showing off the city to potential new hires in February. Ottawa is bound to become more interesting as its economy and population become more and more diverse. Which makes it, perhaps, the most typically Canadian city of them all.